Doing a systems turn up at work and have this blasting on the JamBox. Such a great mix. This is one of the best "What's In My Bag?" I've ever seen. So many great recommendations. Yeah he’s awesome and funny in everything he does. He traveled to Africa on a Fulbright scholarship to study music which explains how he knows some of these obscure bands. Found an old picture of me wearing a Battles shirt. Sat down and ended up listening to this album twice in a row. BlAcKNoVa, Cali Panthers Fan, OMG!WTF! The best grunge band ever (I'll fight anyone who disagrees) released this 30 years ago. Well, I respectfully disagree. Everything in the grunge era is derivative of The Pixies, so on that note, this is what I am listening to now, and their stuff is on a never ending rotation in my mix. I can never get enough Pixies. I have only recently discovered Hop Along. They released a new album back in April called Bark Your Head Off, but I have fallen in love with their debut album from 2015 titled Painted Shut. I am in awe of the lead singer's ability to change styles on a dime and give some depth to her intriguing lyrics. I'm enjoying this song in particular. 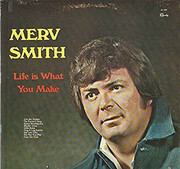 I'm listening to Merv Smith. Why? Because I found this album while cleaning out my big ole storage unit. Who? That is a much more difficult question. "To Doreen, with all my love...Merv"
In a world where your mother's first name looks in print like a new planet, never before seen in an astonished astronomer's telescope. But this name, this Doreen is undeniably my own Mother. And the year of the album is the brief snip of time between my conception and birth. A time when my own parents were happy and carefree. But the eyes. The sideburns. The criminal predator glasses on the inside jacket photo all line up like stars in a constellation seen from a desert long forgotten and melting away to time and loss. So now I listen and I know each steel twang, each robin's egg blue note like it's my own hand, my own cheek, my own life. My parents divorced a year after I was born and now that no longer matters. No longer a Polka Dot. Never again a polka dot. Sub Pop had a 30th Anniversary party yesterday. KEXP live-streamed a bunch of great bands on Youtube.